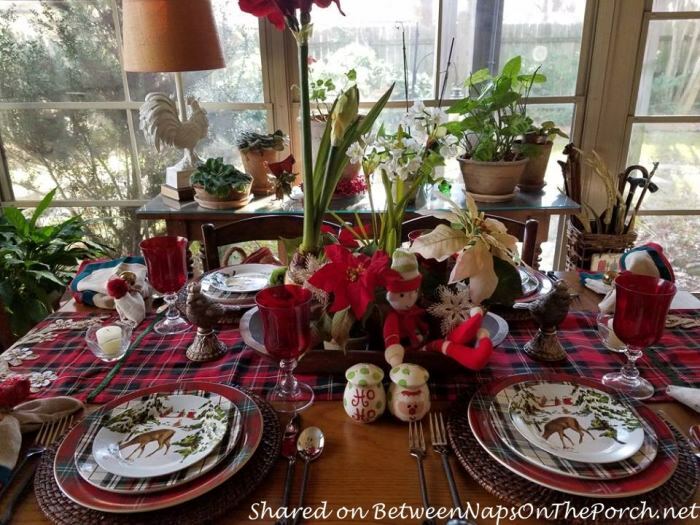 Welcome to the 483rd Tablescape Thursday! Recently Martha had friends over for “Dinner and Dominos.” Doesn’t that sound like fun! I haven’t played Dominos in so long, I’m not sure I remember how. Like so many of us, Martha loves tartans and plaids. I think they are so festive and not just for Christmas. They add so much color and happiness to any room, creating a perfect winter coziness. When Martha shared these photos with me in an email, she said, “I have come out of my comfort zone in combining plaids.” I love that! It’s so much fun when you mix patterns, especially plaids, and discover how amazing they look together! 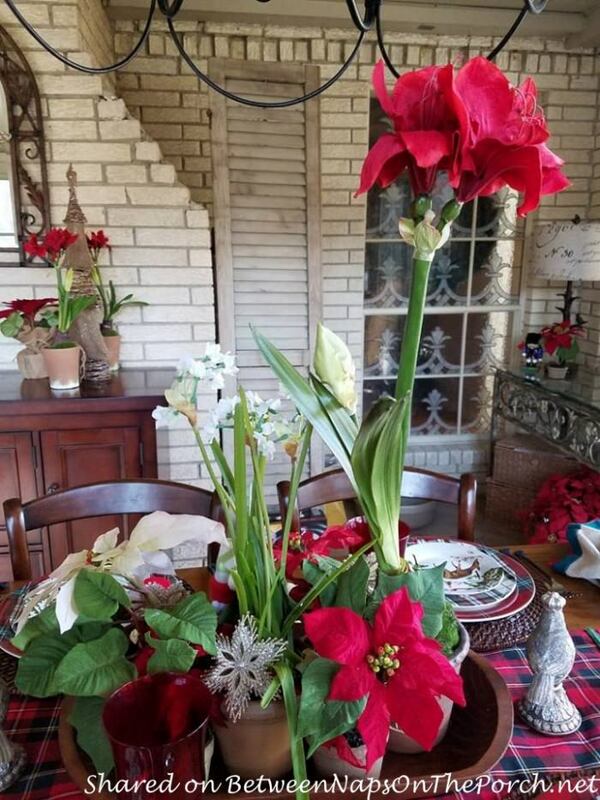 Martha took the centerpiece she had been using on her breakfast room table and used it in the center of her dining room table for this gathering with friends. 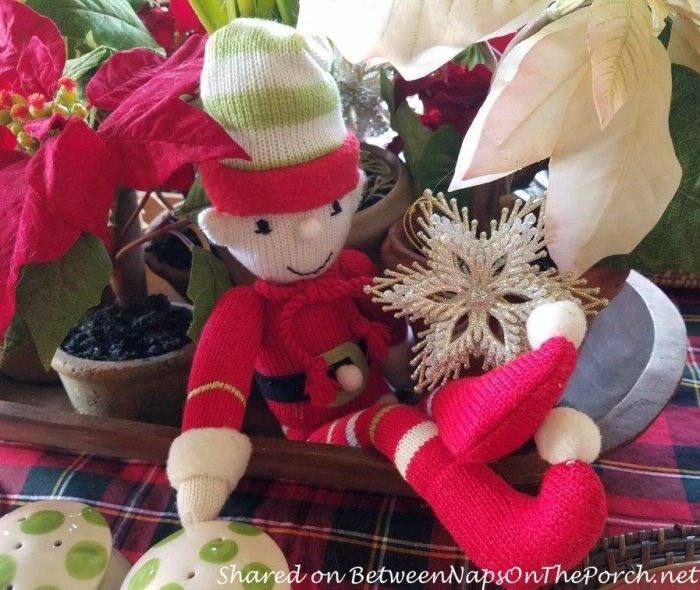 Oh, I think I see a sneaky little elf hiding behind a poinsettia! 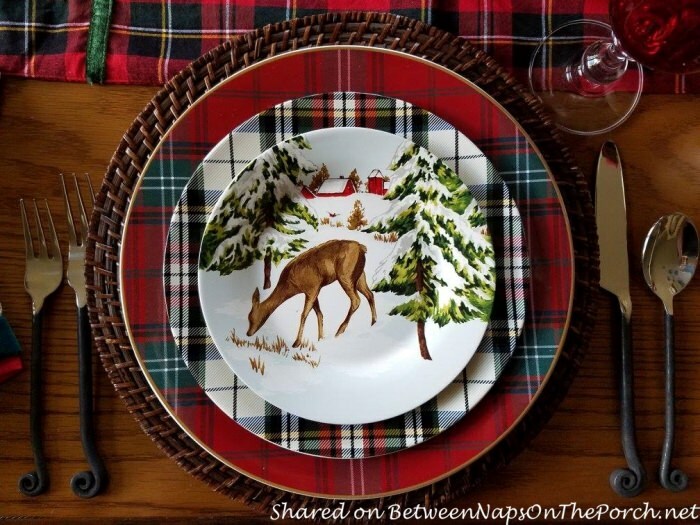 I love, love, love these adorable salad plates and look how great they go with plaid! That’s the amazing thing about plaid, it can create such a wonderful background for other patterns/designs, even in dinnerware. The plaid salad plates are still available here: Plaid Salad Plates. 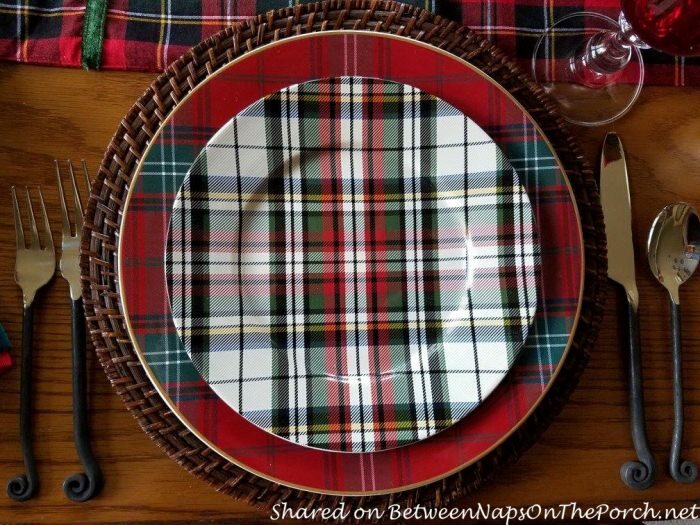 The tartan dinner plates are no longer available at Williams Sonoma, but I did find some here: Tartan Dinner Plates. These cute red birds are from Pier 1. 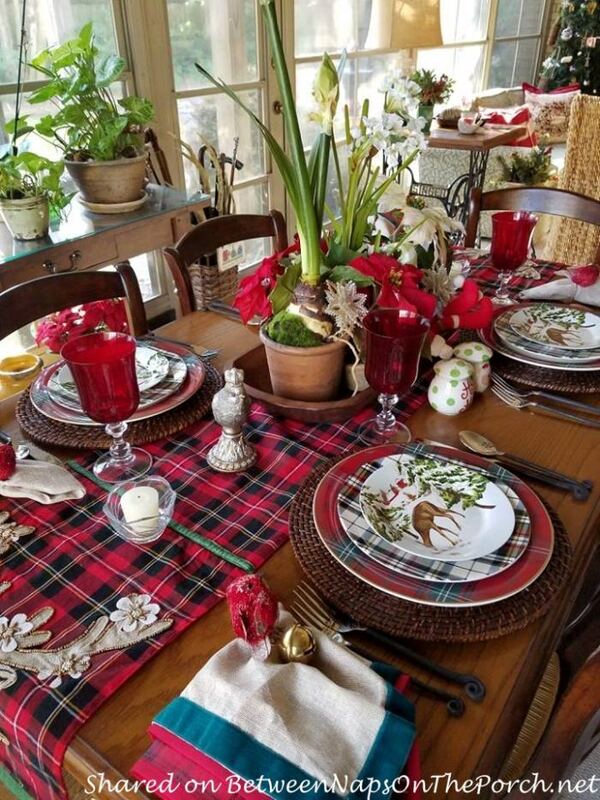 Thanks so much to Martha for sharing this delightful holiday table setting and showing us how easy it is to mix those tartans and plaids for a beautiful Christmas or wintertime tablescape! Susan and Martha, thanks for sharing this cheerful table. I love to mix tartans and plaids anytime of the year. 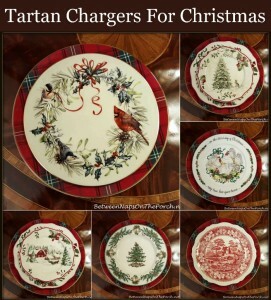 I have a nice stash of different dishes in tartans and plaids, but am on the watch for more dinner plates in the 2010 Classic Tidings pattern from Target. Replacements has some, but the price is crazy. They were sold in sets of 4 for much less than what they are asking for one plate. Back on the subject of this pretty table……love the mix of dishes and the darling deer plates. This is such a great table to warm one’s spirits on a cold winter day. The flowers are the perfect touch. Hello Susan! I haven’t had much time to visit Instagram but I trust you are enjoying your trip! Love the mix of tartans/plaids. Her table is so festive and cozy. I haven’t played dominos in ages either and would definitely need to brush up on how to play again! I like the little red birds and flowering amaryllis! Hi Susan, This is a beautiful table you’ve featured today! 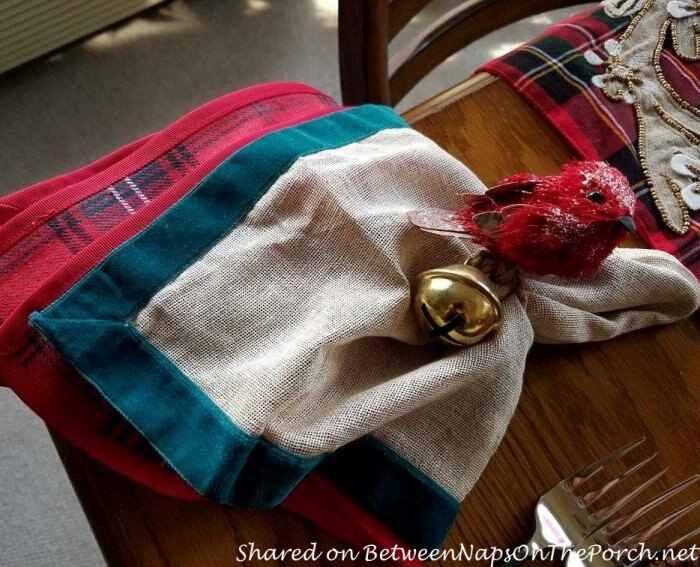 I did tartan plaid for my Christmas table this year, too. 🙂 Love me some tartan. I hope you’re having a great time in Germany. It’s bitter cold here in North Carolina right now, so you’re probably warmer than we are. ;D Have fun and take lots of pics! I couldn’t imagine how well all the plaids do well together until I saw this table. So festive and Christmasy. Thanks Martha, for the inspiration. Hope your trip is going well and not too fast Susan. 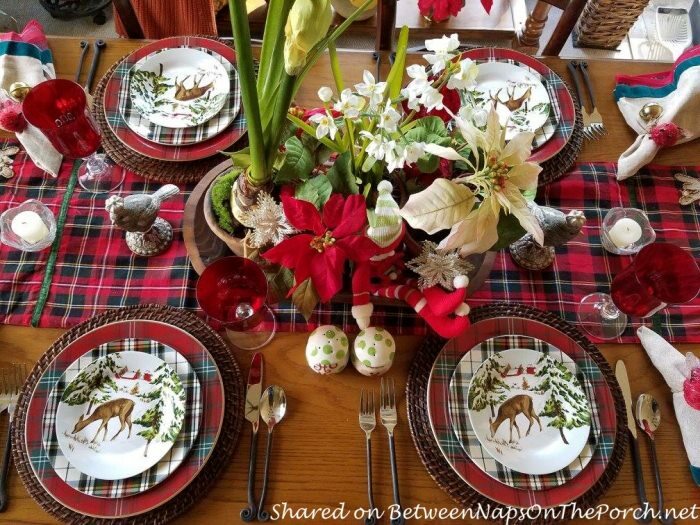 I love, love that table runner with the deer on it! It would go great with my Woodland Tablescape featuring a deer centerpiece. This is a very pretty and colorful table! Love the mixing of the tartan plaids. Great job! 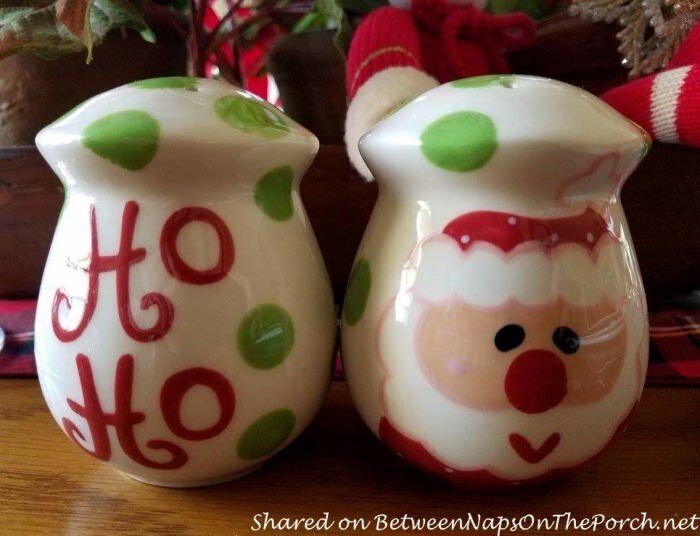 Thank you so much for hosting this linkup every week, Susan – I’ve set more tables this year than ever and it was fun to see so much inspiration from others! 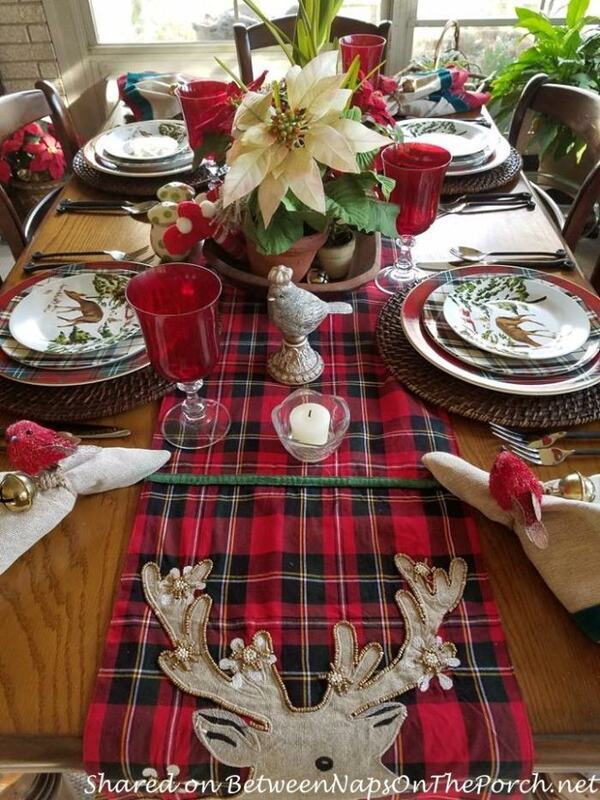 Martha, your plaid/tartan table is fantastic! I suspect it takes just the right pairing to make it work, and you certainly achieved it! 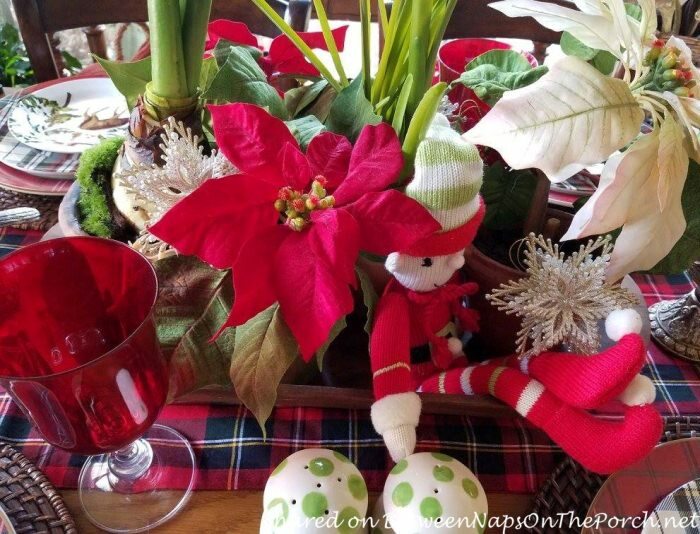 Such a fun and festive table! Hi Susan. 🙂 I hope you’re having a wonderful time on your cruise. The pictures you have posted are wonderful. Wish I were there with you! And I was also wondering if Martha would tell us about the design on the window? (4th picture down, the window to the right of the brick fireplace wall.) Martha, is that a design you applied? I love it! It would be so pretty to do that to a few windows in the winter time. What a beautiful setting to prepare for your friends. I’m sure they had a great time. Thanks for sharing. Thanks for the reply! I love the look. It’s hard to believe it was done nineteen years ago! It still looks so fresh and timely. I’ll have to look into that through the Plaid website. And yes, I even like that name, lol. Thanks again for answering, Martha. I wish I could have joined you for dominoes that evening. Sounds like fun. Happy New Year! LOVE the plaid! Happy New Year (almost) to you Susan! A fun domino game is Mexican Train, we can play it for hours. Mexican Train Dominoes is exactly the game we play, Cyndi. 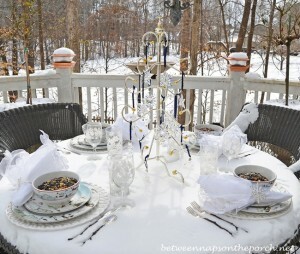 The tablesetting of Martha’s that you featured, Susan, is lovely! Bravo and Go Plaid, Martha!!! I did a little plaid this year, too, in my package ribbons and in a couple of tablesettings. Hope you have a great trip, Susan! 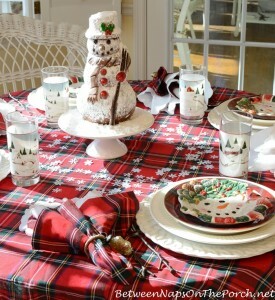 I love the use of plaids for wintertime tablescapes – and it’s hard to mess up, even when combining different patterns. Martha’s table was so lovely! 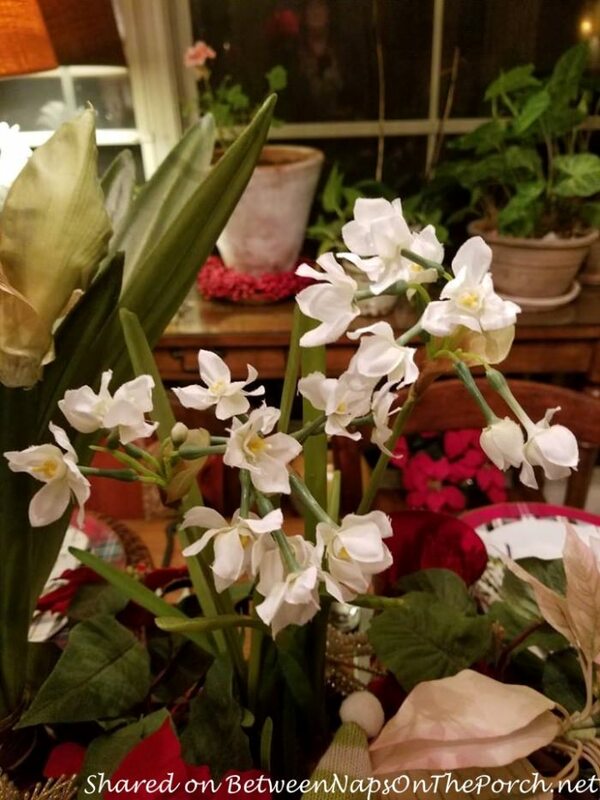 I used to come around this site for Tablescape Thursday and Met Monday, even if just to look at all the pretties submitted. It’s a goal of mine to not only jump back in in 2018, but with wild abandon! Maybe I’ll even post a time or two. 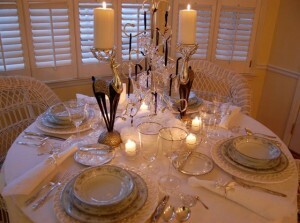 I don’t do much in the way of entire tablescapes, but I love playing around with place settings. deer salad plates. Very festive. Nice of her to share it with us. Beautiful table, Martha! Susan, I suspect you were weakened from being sick before your trip and it’s awful not being in your own home for round 2. I hope you see a doctor there before you attempt the flight home. Happy New Year! They brought one on the boat and he prescribed some Rx. Another passenger was taken off with the same flu and found to have pneumonia. This flu was unlike anything I’ve ever experienced, guess I encountered some germs my body has never seen. I think you’re right about being in a weakened state.